The Folger Theatre's Sense and Sensibility, in an adaptation by Kate Hamill and directed by Eric Tucker, proves a long-standing hypothesis of mine: when adapting great works of prose, the best adaptations are the most boldly theatrical. The less they bind themselves to mimicking the exact tone of the source material, and the more they allow themselves free range to find the nuances that most excite them as theatre, the stronger the production will be. Luckily, Hamill and Tucker as the main collaborators involved here (both members of Bedlam, a theatre company familiar to DC audiences who saw their productions of Hamlet and Saint Joan at the Olney Theatre Center a few seasons back) prove this hypothesis with aplomb, excitement, depths of genuine feeling, and a wealth of unrepentant theatricality and stylization. Most important in this adaptation is the freewheeling spirit of exploration of a familiar story, shaking loose the centuries that have accrued around the story of the Dashwoods, and putting the emotional focus squarely on the relationship between the two eldest sisters, Elinor (Maggie McDowell) and Marianne (Erin Weaver). The two actresses play the sisters' tumultuous, but deeply loving relationship with enormous sensitivity; it's very clear from both performances why these sisters can have difficulty connecting with each other, but likewise how much each others' lasting happiness is their first priority. More so than in any other adaptation I've seen of Jane Austen's story, I felt the love between these two characters and the uncomfortable desperation of their social situation. 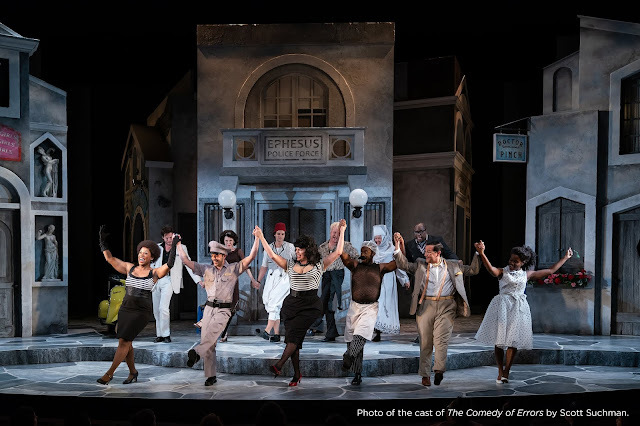 The entire ensemble is clearly relishing their various roles, and work and move absolutely seamlessly in the rolling set designed by John McDermott. The Folger has extended this run through mid-November, and I highly, HIGHLY recommend you take advantage of it and see this production if you haven't already.